Visit Routledge or Amazon to order. 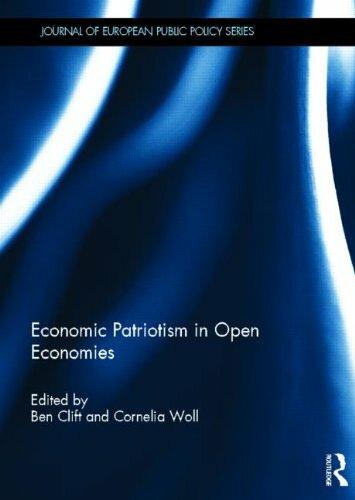 Ben Clift and Cornelia Woll, 2012: “Economic Patriotism: Political Intervention in Open Economies,” Journal of European Public Policy, special issue, Vol. 19, No. 3. Matthias Thiemann (2013) “Accounting, Economics and the Law," Vol. 10, No. 1, pp. 49–54. The recent financial crisis has demonstrated that governments continuously seek to steer their economies rather than leaving them to free markets. Despite the ambitions of international economic cooperation, such interventionism is decidedly local. Some politicians even proudly evoke "economic patriotism" to justify their choices. This volume links such populism to a specific set of tensions – the paradox of neo-liberal democracy – and argues that the phenomenon is ubiquitous. The mandate of politicians is to defend the economic interests of their constituents under conditions where large parts of economic governance are no longer exclusively within their control. Economic patriotism is one possible reaction to this tension. As old-style industrial policy and interventionism gained a bad reputation, governments had to become creative to assure traditional economic policy objectives with new means. However, economic patriotism is more than just a fashionable word or a fig leaf for protectionism. This volume employs the term to signal two distinctions: the diversity of policy content and the multiplicity of territorial units it can refer to. Comparing economic interventionism across countries and sectors, it becomes clear that economic liberalism will always be accompanied by counter-movements that appeal to territorial images.